Caption slip reads: "Photographer: Wilson. Date: 21-08-1958. Assignment: E.M. Biscailuz. Special instructions: Made Deputy of Texas town. 33-34, 66: L/R: Sheriff E.W. 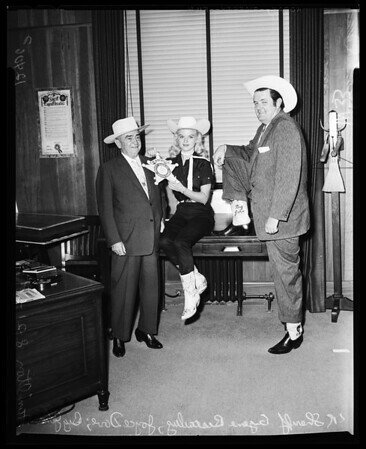 Biscailuz is made lifetime deputy of Bexar, Texas by Joyce Dove and "Big John Hamilton."